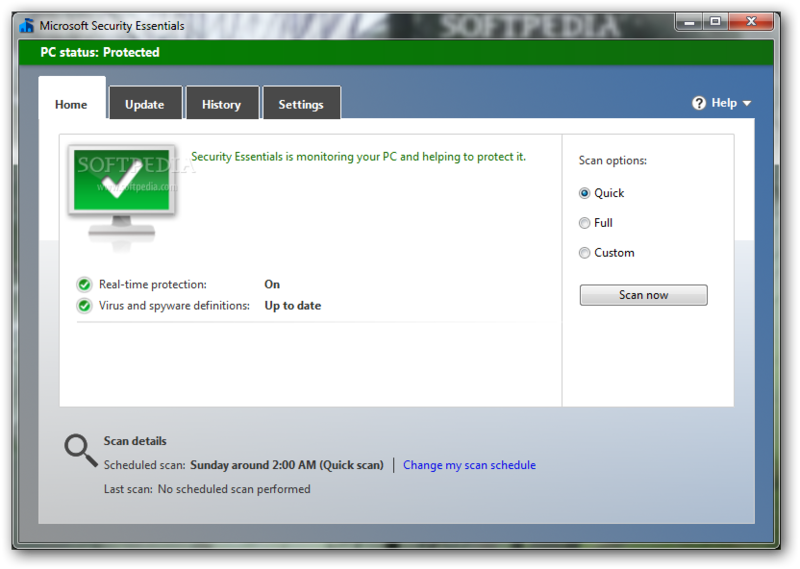 In this guide, we will learn what is windows defender and how to turn on windows defender. As of now Microsoft is providing preinstalled own antivirus program called windows defender for windows 7 and Windows 8 OS users to provide minimum level of protection to users who cannot afford or do not wish to purchase third party anti-malware software. If you do not have any other third party antivirus installed on your windows 7 or Windows 8 OS, then please make sure that your windows defender is on and properly configured to protect your PC and data. 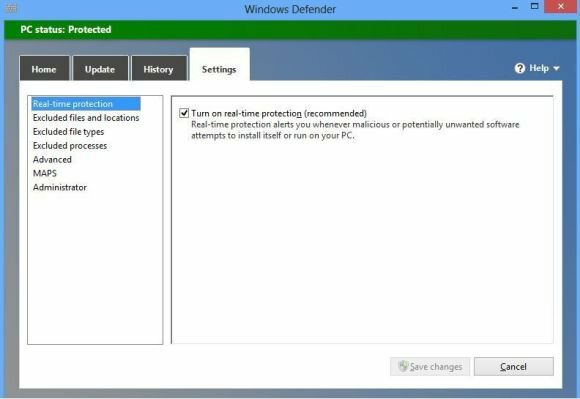 In this guide, we explain in detail how to use and configure the windows defender antivirus program. I think we should all appreciate this gesture from Microsoft where they do not try to up sell this product with nagging alerts and banner advertisements. From your windows 8 desktop app, press your windows key, then on the start menu type windows defender without quotes. On the Home Tab you can see green check which mean defender is on and protecting your computer. This is also the tab that allows you to scan your computer for viruses. You can do a full scan, basic scan and custom scan with which you can scan a folder. 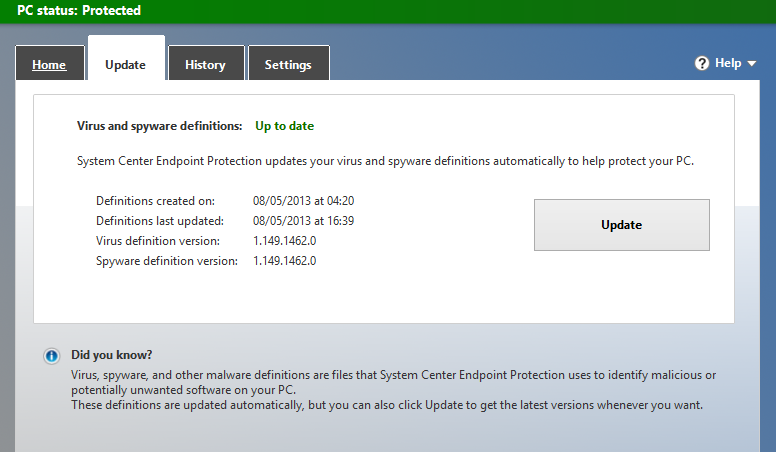 The update tab can retrieve new definitions and protecting your computer from new viruses. Just click the large update button to download them from the internet. Make sure that you are connected to the internet. The history tab shows you your scan history and viruses that are captured. You can look at the history of the quarantine. The next tab which is settings tab has many useful features. 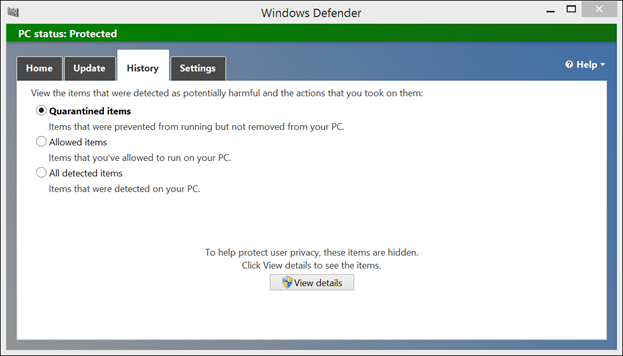 Here the single most important feature that you need to know is how to turn off and turn on windows 8 defender. If the defender is slowing your computer down you can turn it off or if you would like to use third party antivirus software. 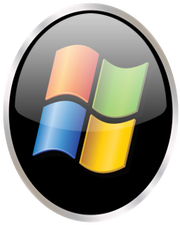 But in the case of third party antivirus software, windows 8 OS will automatically recognize it and will make it as default antivirus software. We recommend checking the scan removable drive option as well as creating restore point which helps you fall back on if something goes wrong. 6. Once you turn the windows defender on and go to action center, it will you not give any more alerts and it will report that everything is good on your PC with antivirus protection enabled. If you would like to turn on the defender once again for some reason, click the small flag icon in your system tray and select turn on antivirus protection.